As I write this, I’m still getting used to the silence at home. Silence from the absence of the pitter patter of little feet moving about everywhere, the chitter chatter coming from the little mouth which is the best music I have ever heard and the clitter clatter of toys and musical instruments in the play room. 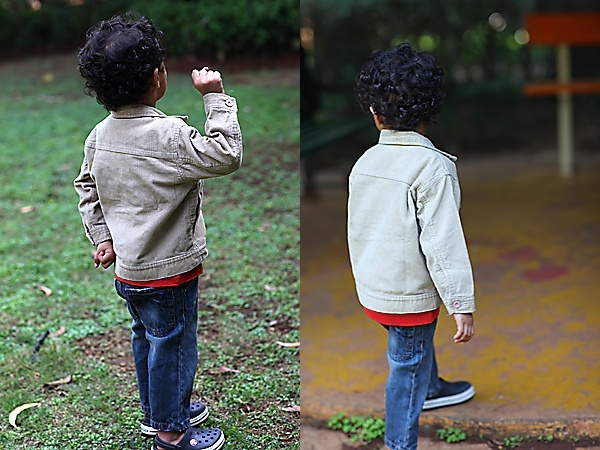 It’s been nearly seven months since Hari started playschool and put his tiny footsteps into the real world, a world outside his cocooned home. It was also my first step in learning to let go and allow my baby to thrive and develop his own identity and individuality and realize that as much as it is important to protect and envelop your child it is equally important to empower him with independence, little by little, step by step. 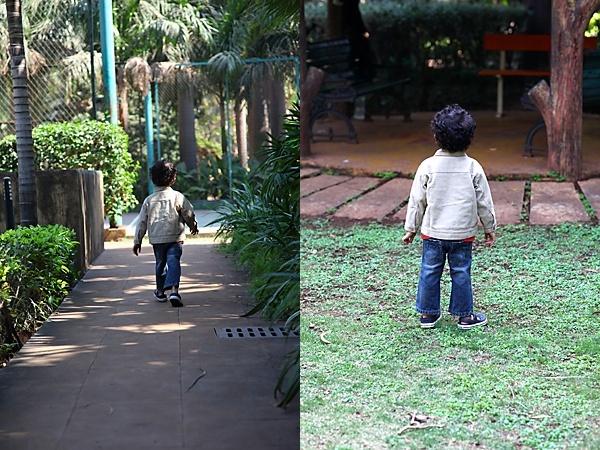 While I’m still getting used to letting a piece of my heart going away from me, the realization of fleeting time dawns and it’s Hari’s 3rd birthday already! I woke up a little before dawn on the 10th of March 2012, shut myself in my study and indulged in deep contemplation about my life with our most precious being that I had brought into this world. He had grown into a little boy from the infant I had nurtured in my womb. He was slowly coming into his own and his intense curiosity about everything around him, deep love and affection for everyone around, joyous nature and playful spirit that lit our lives each day! Nevermind the fussy eater and light sleeper that he is and the toll it takes on me! That should be saved for another day altogether! And it was as if time flew past and I remembered my paternal uncle’s words when he saw my two month old in his cradle and said “before you know it he will be off to school”! How true! I was shaken by this reverie when I looked at my watch and calculated the time left for the birthday party to begin. Both the sets of grandparents had arrived! The uncle and aunt and all his friends with their parents were slated to arrive in a few hours! The cakes I had baked and iced were resting in the refrigerator. The decorations and other tiny preparations were yet to be done and with all this in mind, I set to get ready with much excitement, preparing myself for the day ahead! When I started to plan for Hari’s party, I was stumped for the lack of an idea for the theme! Hari (as of now) has no favourite cartoon character as he hardly watches television. I thought about him dancing and singing! This boy loves to sing and dance and can live on music! Then the idea struck! Hari’s Music And Dance Birthday Party! 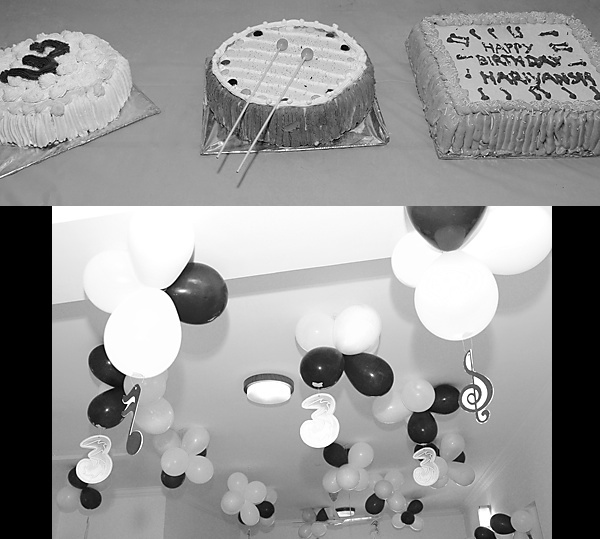 The birthday party had a lot of music and dance, games centred around Hari’s favourite rhymes, ceiling danglers made of musical notes and the number three, coloured baloons and ofcourse food! Last year, I got away with making a simple yet one of the most delicious cake I have ever made. This year as I become more aware of my son’s distinctive tastes, I’m better equipped to cater to his needs. One constant amidst his ever changing tastes is chocolate! More specifically dark chocolate! This boy savours the darkest chocolate with the same enthusiasm that one would eat a milk chocolate! When, I asked him what cake he wanted, I already knew the answer! Chocolate cake! Being a mother changes so many aspects of your life and at times even points of view. For the first time ever, I iced my cakes with food colours. How could I refuse my little angel with the most adorable curls and sparkling eyes asking me specifically to make him a drum cake and a cake with pink roses! He eats healthy most days of the week or I could say most days of the year with absolutely no junk thrown in and fresh meals made with organic wholesome ingredients. I thought to myself that maybe once a year, I could relax my rules a bit and bring in some fun elements. The result was three cakes to feed 80 to 90 people, a chocolate cake made with cream and caramel icing and decorated with musical notes in keeping with the theme of the party, a drum cake in keeping with the theme and the return gifts which were a set of drums and a cake with pink roses and the number three in keeping with my little darling’s request and to signify his age! My baking expeditions did not end with the party. I had to make cupcakes to take to school and I happened to make 72 of them, 46 for the school and the rest for home! I used my never-fail, best ever chocolate cupcake recipe and iced them with basic buttercream studded with a gem each, adored by children and adults alike! I doubled this recipe and made one 11” square cake and two 9” round cakes. I have used cream icing but you could use a butter cream icing as well and use your imagination and creativity to decorate the cakes. Grease and line a 11” square, 12” round or two 9” round cake tins with greaseproof paper. In a large bowl put in the plain flour, cocoa powder, baking powder, baking soda, sugar and mix with a whisk or a beater. In another bowl put in the condensed milk, milk, melted butter and vanilla extract. Preheat the oven to 150 degrees centigrade/300F. Mix in the wet ingredients into the dry ingredients and beat with a hand blender until well combined. Pour the cake mixture into the prepared tin and bake for an hour, until s skewer inserted in the middle of the cake comes out clean. In a saucepan mix the sugar into the water and cook on medium flame until the syrup comes to a boil. In a chilled bowl, whip the cream until stiff peaks form. Mix in colours (preferably natural) if required. Once the cake is done, cool on a cake rack. Place the cake on a cake board or a serving plate. Pour the sugar syrup carefully over the cake to moisten and wet the cake. Spread the cream evenly over the cake. Pipe the remaining cream with decorative icing. Cool in the refrigerator for a minimum of 2 hours before serving. * Since I don’t have access to good quality whipping cream, I used Rich cream as I was baking for a large crowd and couldnt afford to take risks with icing accidents. I normally use buttercream or fresh cream whipped this way for icing my cakes. Hey Anu, you have outdone yourself with the cakes! WOW! I don't think I've ever seen a mom of a 3 yr old boy who could bake so much for so many people!He must be a real sweetheart to give you the time to do all what you wanted to do. If I remember correctly, you bought a cake for his 1st b'day right and promised yourself never to do that again? Well, you've definately made up for it now 🙂 Hari is the luckiest boy on this planet!! I wish I could see the glowing face of the little boy blowing the candles on his BIG day! WOW Anu!! This is simply Superb.. 3 birthday Cakes & 72 Cup Cakes!! that too each cake so delicately and meticulously decorated keeping in mind little Hari's wishes and birthday theme.. What a commendable job! I have been waiting for this post and it truly is worth the wait! Good to see some more pics of you and Hari.. they are adorable. I have a question regarding cakes- Though, I love baking cakes, i have not been completely successful yet. I tried baking the golden yellow cake and followed the recipe EXACTLY as it is. I observed that the cake turned out a little hard and the sweetness was not enough. For sweetness I can always correct it by adding extra Sugar, but not sure how to correct the "Hardness".. Does Blending the cake mixture with a hand blender lend to the hardness? Please help. I think this recipe must have been the most awaited one…..Lovely pics….the cake, ur pics with ur son and the final one with ur cupcakes…U r a Star Anu! Hats off to u …3 cakes n 72 cupcakes is actually unbelievable…n the birthday theme was good too..
Anushruti, first of all a very happy belated birthday to your son and I hope life bestows all its blessings on him. I love all your recipes but I think the one's featuring your lovely cakes are my absolute favorites. A new post with gorgeous looking cakes or other desserts just brightens up my day. This post is especially delightful because of the special occasion and also because of the beautiful colors. All the cakes are looking fantastic but I really, really love the drum cake. I am sure they were all yummy. Happy b'day to your little one Anu. my boy also turned 3this month and i love cooking and baking for him. what beautiful cakes you have baked for him and so many of them. hats off to you. I also baked a jungle cake with fondant animals. anything to see their eyes twinkle. You are one amazing mom Anu,I am sure li'l Hari was a very happy birthday boy! 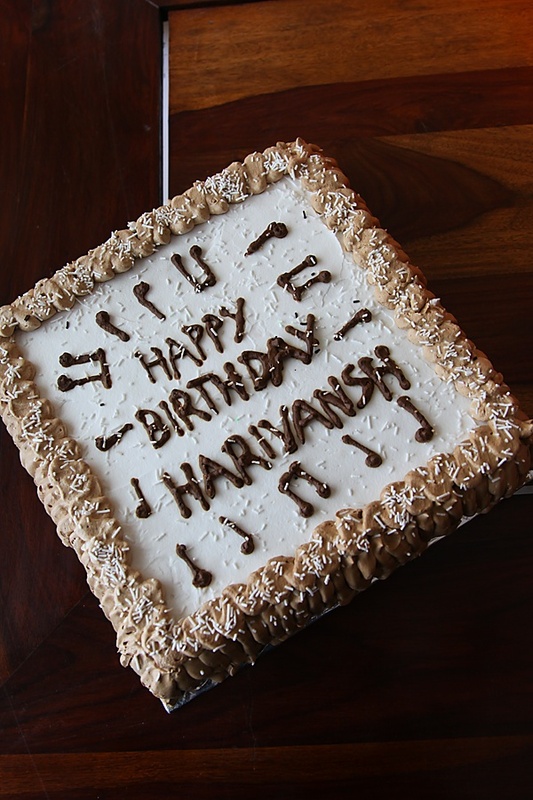 !Love all the cakes and I am sure a lot of time,energy and effort went into it.It is all worth it isn't it?Belated birthday wishes to dear Harivansh! This is simply super!!! Now, I have become a regular reader of your blog.There is so much to learn from you. I really loved your work it is really a piece of art. Lots of love to you. God bless little Hari – may he grow into a strong healthy responsible citizen. He has such a wonderful wonder – making him the most gorgeous treats! 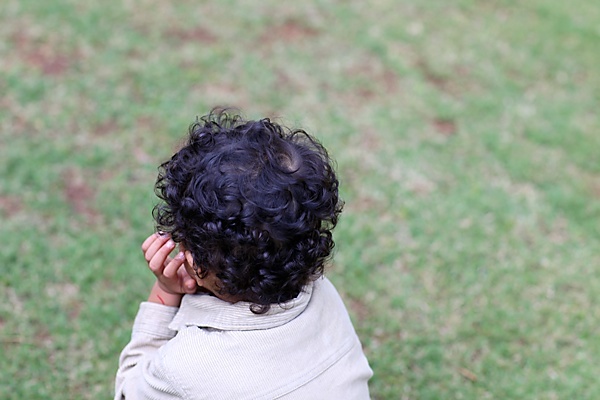 Love his curls – so sweet – I know the exact feelings you nurture – I have a little boy who turns 2 in May. Also, WOW! 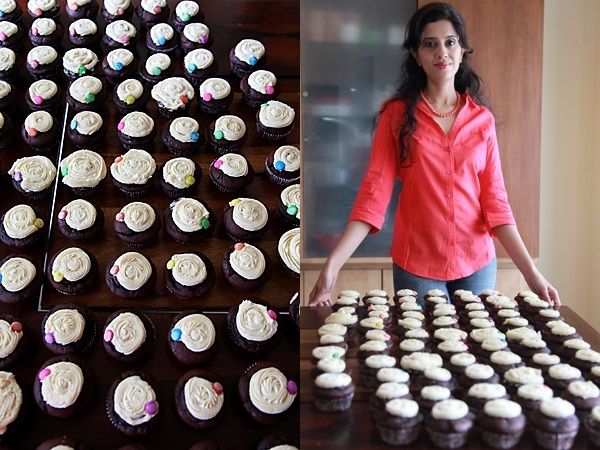 Incredible baking Anushruti – scores or cupcakes and 3 cakes! I'm truly inspired 🙂 God bless you & your family. Thank you people for all the appreciation! Meena: Yes..I was particular about making the cakes myself and having the party at home. I would have cooked up a feat if the guest list was about 25 or 30 but my guest list was running over 80 so I had to hire a caterer for the food. Ria: He is the sweetest no doubt but as far as giving me the time I can't tell you the juggling around this took to get accomplished! Also, the fact that his grandparents were around and he was distracted with the gifts they had brought helped a great deal! Kudos to your elephantine memory girl! I had to call for a cake from outside for the 1st bday party although I did make strawberry cupcakes for him at home. He used to literally cling to me, wake up at nights frequently for feeds and I couldnt imagine doing this with all those sleepless nights sitting up and feeding him! Ashwini: Thank you! You are a sweetheart as always! As far as that cake is concerned, its one of best tasting and great textured cakes in my repertoire. Have you measured the ingredients accurately? You need to be very precise in baking. Measure either with cups (1 cup =250 ml) or preferably in metric on a weighing scale. Over beating a cake mixture can also give a hard cake. Hope this helps. Poornima: I'm flattered! Look forward to hearing your feedback! Happy baking! 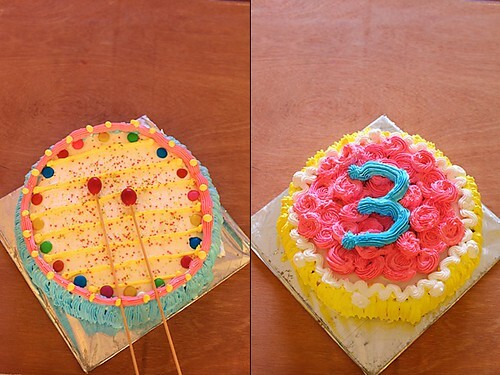 Sayantani: Congratulations for your son turning 3! Yes…anything to see their eyes twinkle! Divya: Thank you for your wishes Divya! Yes he was a very happy birthday boy! Namrata: How nice to know that and how nice to hear from you! Nandita: Thank you for your wishes. Sneha: Thank you for your sweet wishes for my child. Love to your 2 year old! `wishing a belated happy b'day to ur little boy…and hats off to u for such a baking marathon. Incidentally for my son's 3rd b'day. I too had made an eggless chcoco "Drum" cake..all the cakes look lovely! Many happy retunrs of the day to Harivansh! You look gorgeous! Amazing cakes and they look so colorful and very very delicious. Happy Birthday to Hari ! It is a treat to read your blog Anushruti. Delicious recipes, imaginative photos & heart touching articles. Keep up the good work ! Your parents & family must be proud of you ! Belated Happy Birthday to ur kiddo !!! Wow! Those are Gorgeous looking cakes! The cupcakes look so yummy… Happy Birthday to Hari! Love ur blog a lot…..I too love baking and cooking…..but am a pure non vegetarian but your vegetarian collection seeked my attention…..Liked ur cake posts of the three birthday cakes. I too always use Rich's whipping cream and it gives excellent results. I'm following your blog. Happy Birthday to ur son! Raj Biring:Children are intelligent and when things are explained in a logical manner, they understand. It might help if you talk to your son about the importance of eating well and choosing the right nutritious food. All the best! Anamika: How cool! Nice to know that you made a drum cake too. Shoba: Thank you so much! Usha: Thank you for your kind words. Vidya: Feeling flattered! 🙂 Thanks! Priya: They were indeed very good! Wish I could share them with all of you. Chinmayie: The numbers don't matter really! All the love and affection you would put in whatever way you make it will be the most unique cake for your daughter! Smitha: Thank you. I don't use Rich cream at all as I have mentioned in the post. I had to use it as I didnt have access to good cream. Taruna: That's a very sweet compliment indeed! Thanks! Earlier I was using rumford aluminium free baking powder (available in the states) but now I have switched to blue bird baking powder which is also aluminium free. I pick up baking soda from my local store. Kulsum: Thank you for your wishes. Hi, a query again pl… Can baking soda be replaced by 'Eno' ? Ambika: Thank you for the Santoor compliment, not sure about the Asin part though. 😉 Wish you were there too. Taruna: No, please don't try and replace ingredients in baking especially eggless baking as you won't get the desired results. What a precious little boy – so adorable! The cake you made looks fantastic. I am in awe of how much baking you did for the school. Amazing! My! My! that is some baking you did girl :D. Wish i was one of the invited to dig on those…lol. What can i say…adorable son (love his curls), super attractive mom (necklace looks great) and OMG i want a bite cakes:). Did you say 72 cupcakes also?? you are insanely energetic..hats off to you. Wow!!!! U just rock!!! super cute pics and yummy yummy cakes!!!! happy birthday Harivansh!! I am a silent follower of your blog. I love the receipes you have here which are simple to work with. Your son is so cute. Please can you advise me on whether I use this Birthday Cake Receipe to make muffins? Pan Cuisine: Thank you for all your sweet words! You are a doll! Kuresha: How nice to hear from you! Yes you can use this recipe but if you want lesser quantity follow my eggless chocolate cream cupcake recipe (link given above). Avanika: Thanks! Yes…it was a treat to take them to school. Congratulations with the birthday of your beautiful boy! 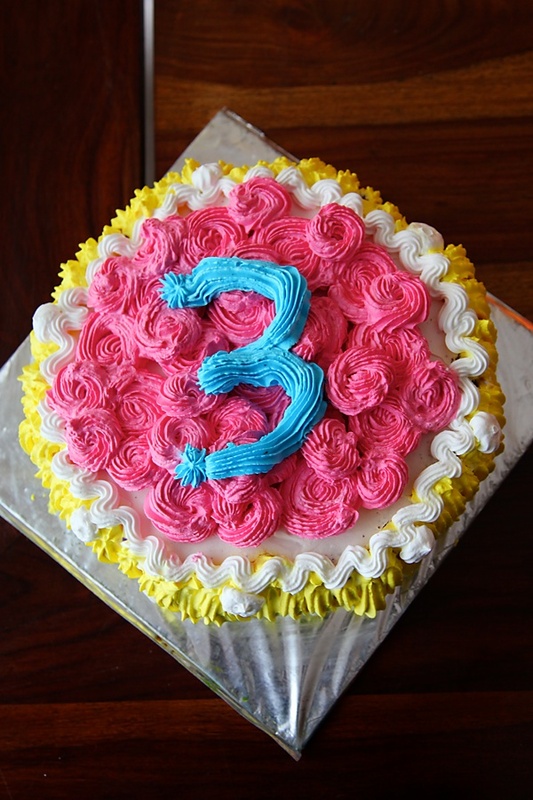 3 years, such a great age… (my smallest daughter is 3 too!). You have described so well how difficult it is at times to allow them to get more and more independent….and how proud you feel at the same time! What an effort you've put in making all those cakes yourself… the result is just beautiful! Well done Anushruti, your son has a mother to be proud of! Marian: Yes…3 years is indeed a very beautiful stage! Feel like holding every precious moment. Thank you for your wonderful words. Love to your daughter. Have recently started the icing bit…jus wanted to know will the cream not become too liquid and start spilling over the cake…does it remain that stiff? Bhavana: Thank you for your comment. Am glad you like my recipes. If the icing has cream then it is refrigerated which makes it a bit stiff after it sets. So, don't worry it wont be runny! And if the icing is buttercream or butter icing then it sets even without refrigeration. Stumbled upon your blog and girl you are superb. Love the cakes and the photos. I am so bad with food photos. although I love to cook. Not too sure if I can bake the way you do. so cool. Have to tell u ..u are gifted !!!! Can u tell me on what temperature and for how much time do we need to bake this cake? Shruti: Read the recipe carefully. Your answers lie there. It was my maiden attempt at baking. Must say, it came out beyond my expectations. The texture and taste were perfect, thanks to your step by step method. Am going to try baking all your cakes one by one :). Uma J: Thanks aunty! Looks forward to your feedback! Loved ur blog and ur recipes. I've a query regarding baking 2 cakes. I've an OTG, and am unaware whether I can bake two cakes at a time in it. I guess it is a NO. So if I want to try a layered cake, so can I prepare the batter and bake 2 cakes one after the other? Like, once the first cake is baked, can i bake the another one? Please help ASAP as I want to bake one for the 31st Dec night party…Thanks a ton for ur wonderful recipes…. Indira: Sorry for the delayed response. Yes you can bake them separately. You can also make a single cake and slice it into layers. This requires a little practice though. blog (I also love the theme/design), I don't have time to read it all at the minute but I have bookmarked it and also added in your RSS feeds, so when I have time I will be back to read a lot more, Please do keep up the awesome work. Hey there! You have a amazing blog with great recipes. I need a little help here if you can help. My son is turning 3 yrs old this Thursday I.e. 14th march 2013, and am planning to make 100 plus cup,cakes so how should I do it. It has to be eggless. And can I make batter for few batches together and then bake. Help…. Estela: How nice to hear from you! Look forward to more feedback from your end. Shivangi: Extremely sorry for the delay! Somehow missed your message. Use any recipe and double or quadruple it to your requirement. You can make batter at a time and then go on baking. any alternatives for the condenced milk plz?? Wow!!! that was really awesome Anushruti…I love your blog so much.I am also a pure vegetarian who eat only satvik food.I love baking my own but i am not successful mostly. Can you specify what type of oven with what brand you use for baking this type of cakes? ?I would love to purchase one such. risa: I have other cake recipes here which do not use condensed milk. Since the last three years, I have been making your cakes for all the birthdays in my family, the basic eggless vanilla cake, the golden yellow cake, the chocolate birthday party cake, the chocolate ganache cake, the pineapple cake – so happy to let you know that they never let me down! The best part about your recipes is that they are so perfectly measured and described and I know that if i blindly follow your recipe, I am sure to have a winner. You never exaggerate taste or texture, you never downplay them either. Thank you so much for hosting this blog and sharing your cooking and baking expertise with all of us. Thanks to the confidence inspired by the recipes on your blog, I made a tiered chocolate birthday party cake for my son this year and everybody loved it. I took up the challenge of baking for 70 odd people based on this specific chocolate birthday recipe of yours. Thank you again – everybody loved the cake. Harini: Your words made my day! Thank you for the inspiration. i love your cakes.. Its look delicious…Speci. a chocolate cake made with cream and caramel icing and decorated with musical notes. can you please tell me how to make caramel icing . 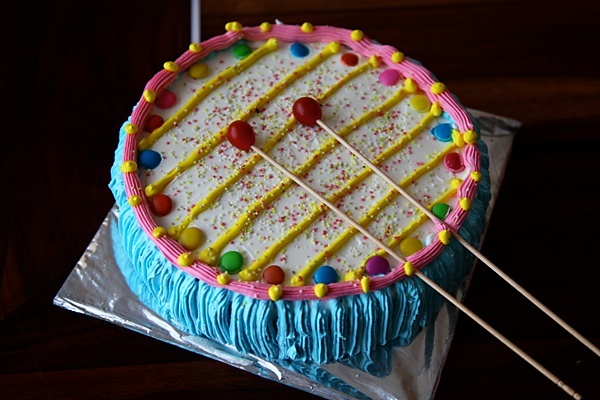 I would love to have the recipe of an egg-less birthday cake, my family members are pure vegetarian, and we would like to prefer a low-budget birthday party for my growing son at home, as he needs to have a fun time with his friends outside home, and he would like to have handsome amount as his pocket money on the occasion of his sixteenth birthday. Nisha: Just mix in caramel (homemade or store bought) with cream and whip before piping. Hi, I am confused… The proportion of the ingredients mentioned is for the 3 cakes?…. Or when th proportion is doubled its going to yield 3 cakes, pl? Say, if I am looking to make a cake of about 1 kg, then how many gms of maida shud I use, n what size cake tin cud I use, pl ? Will half and half work in place of heavy cream for the icing in this recipe ? Taruna: It is mentioned in the headnote of the recipe that the recipe was doubled to get 3 cakes. This means this recipe is for one large cake. Lalithe: half and half wont whip like heavy whipping cream. 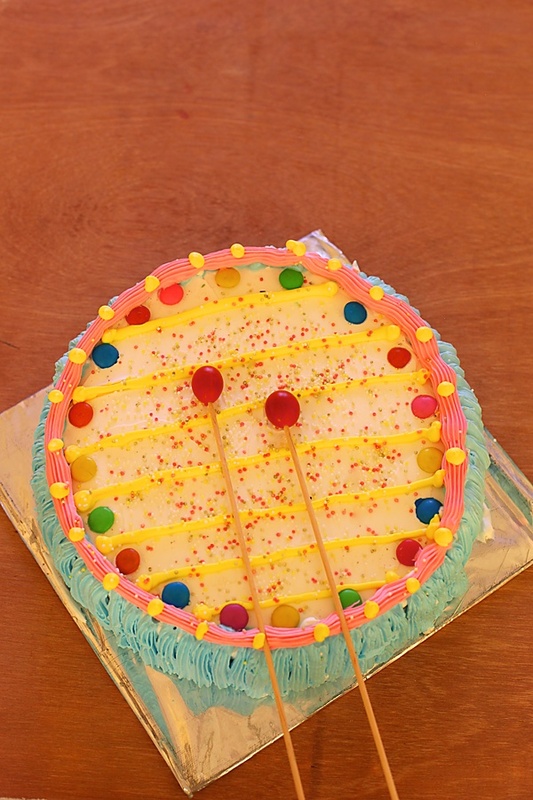 and fill in my filling, will this cake still hold the shape…. ? Devasena: I think it should. I dont see why it shouldnt. I am planning to make a 11 inch square vanilla cake. Can you please let me know if i can alter this recipe. Julie: Skip the cocoa and replace with plain flour. Or use my vanilla cake recipes. Hope that helps. Good luck! I need to do some marathon baking for my daughter's 6th birthday. This is the perfect recipe for it 🙂 Thanks for sharing. Quick q – I'm planning to use Rich's topping as well for the same reasons you did. How much of topping did you require for the doubled recipe? Thanks so much. Noodle head: I require about 1/4 pack for one cake. All the best for your daughters birthday! with valuable info to work on. You've done a formidable job and ouur whole community will be thankoful to you. Could you tell me 60gms sugar is how many cups, did you use granulated sugar or crystallized? I wish to make this recipe for 30-40 people. Should I go ahead with one large cake or one and a half would be sufficient? Could I use less amount of cocoa powder, what difference would it make to the proportions? Swapna: Use 1/2 cup icing sugar or powdered sugar. One large cake of the above mentioned quantity should be sufficient for 30 people but to play safe you can make 1 1 /2 quantity. If you want to reduce the cocoa powder replace the same quantity (preferably measured in grams) with plain flour. bhavana: Used a variety of tips..simple star nozzle and I think wilton 1M and 2M. Bhavana: Thanks! Used a simple star nozzle.